Desert Candy حلويات الصحراء: Why I Live At The P.O. Two people meet, they fall in love, they share a wonderful summer together, and then they are forced to part. It's a typical love story, one echoed over and over in literature and clichéed in summer romances. My own love story is much the same, with one slight variation: we met, we fell in love, were forced to return to our separate cities, and then the packages began. My mother instilled in me a love of the postal system: she is one of the few people I know who still sends handwritten letters; traveling in southern France one summer, we stopped at the local post office of each tiny town, sometimes to send a postcard or buy stamps, often with no particular purpose in mind. Now, my mother and I exchange postcards constantly, often with nothing written on the back other than the address, a visual way of saying hello. My boyfriend and I have lived a short plane hop apart and with as little as a few tangled inches of sheets and as much as 5,663 miles between us. When you love someone that much, you count the miles, the minutes, the inches. We have amassed cell phone minutes and Skype bills and frequent flier miles, and peppered the post with letters and packages. As a girl that loves to bake, I found my perfect excuse, wrapping up boxes of my mom's stellar chocolate chip cookie recipe, baking macaroons late at night. I nibble at edges, sneak a cookie or two, and then quickly wrap them for mailing lest I pilfer the whole batch. Concerned I might be damaging his glycemic level, I have even made crackers and baked breads, if I could have made and mailed a curry, I would have. I won't pretend every confection was perfect, he has been victim to my baking experiments, low-fat baked goods that probably didn't travel well, but each has been stirred with love. There were lessons along the way, explaining to my London-born companion what a praline was, about eating them every summer in the market in Charleston, about the low-country cuisine of my youth. Those sugary pecan confections were a hit, even the little crumbly bits at the bottom of the tin, and the parts I scraped out of the pan and crunched from the spoon. There have been lessons of other kinds as well, that distance can be surmounted by dedication, but also that distance can be difficult, and that a box of cookies can't solve everything. These wonderful confections may take a little practice to get right, but even the not-so-perfect ones will still taste great. Some people prefer to add all the pecans at the end but I like to add half of them at the beginning, so they get a nice toasty flavor without over-crowding the pan. 1. Line 2 baking sheets or a work surface with parchment or wax paper. Get two large metal spoons and rub them with butter or oil to grease. 2. Place the sugar, buttermilk, butter, salt, and half of the pecans in a medium-sized heavy duty sauce pan. Place over medium heat and stir so that the sugar dissolves. Bring to a boil and cook over medium-high heat until the mixture just reaches 236 F, about 15 minutes. 3. Remove the pan from the heat, add the vanilla and remaining pecans, and stir the mixture rapidly until it just begins to lose its shine, only about one minute. 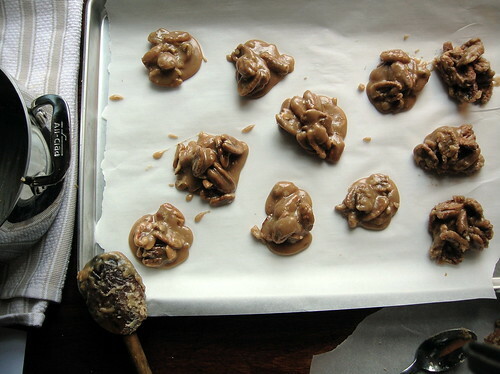 Working very quickly, use the two greased spoons to dollop out pralines onto the parchment. Don't worry if it seems runny at first, the mixture will begin to set very quickly. It's better to start sooner and have a runny one at first then risk having them harden in the pan. 4. Let sit until firm, store in an air-tight container at room temperature. Note: Inevitably, your last few pralines might be less then pretty, but they'll still taste good. There will probably be some stray sugary pecan bits stuck to the pan, these are excellent crumbled over vanilla ice cream. In the unfortunate event your mixture hardens very quickly, you can pass off the nuts simply as sugared pecans. That's a beautiful story Mercedes. I think I like your idea of sending postcards just for the heck of it. What a beautiful, heartwarming story Mercedes. Thank you for sharing. I agree with your mother, small town post offices (and grocery stores, and even courthouses) often serve as destinations themselves -- they teach us a lot about the communities they serve. The next time I make pralines, I will think of you and your love fondly. Lovely post... and although a box of cookies can't solve everything, it can still be a precious line of communication - for a small time, you are connected through a delicious labour of love. These look wonderful and much like the recipe I've got laid out to try soon! When something gets in the air it travels really far and wide. My own love story is much the same, with one slight variation: we met, we fell in love, were forced to return to our separate cities, and then the packages began. Anybody who has spent time in the USA south, knows and loves pralines! Thank you for such heart-felt comments. What a great post Mercedes. You mention Charleston which is where I live. Are you from there? Do you ever visit? Beautiful post. It makes me feel homesick for the South, seeing those pralines. I used to go to New Orleans quite often and eat so many of them, I would get sick. Helene- My family had a place on Pawleys Island for many generations and we would spend summers there and usually have a day trip or two to Charleston (about 1+ hour south). Now we usually rent or stay with friends, I still get to S.C. about once a year, not nearly as often as I'd like! For me, as a cook, the best way for me to express my love is to cook for the people I love. I think that is the magic ingredient that makes my food taste so delicious to them - they can taste the love, and I am sure that your boyfriend can taste the love and sweetness that comes in those packages! 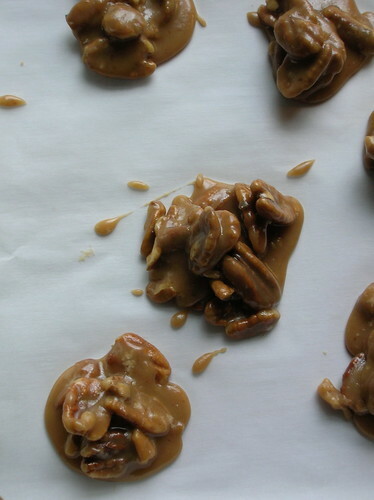 I've been looking for a recipe for pecan pralines for the longest time. These look incredible. Thank you! Oh, Mercedes I love this post. I love to hear about your mother's habit of sending postcards, handwritten letters, the two of you exchanging postcards..the parcels..I once had a boyfriend who lived far away..and it was so hard..your post just brought so many memories back. AS for the food parcels, perhaps I ought to get a few tips from you about packing to send food long distance. Beautiful recipe as well. I love pecans and would love to try t his recipe here. Thank you so much for posting this. 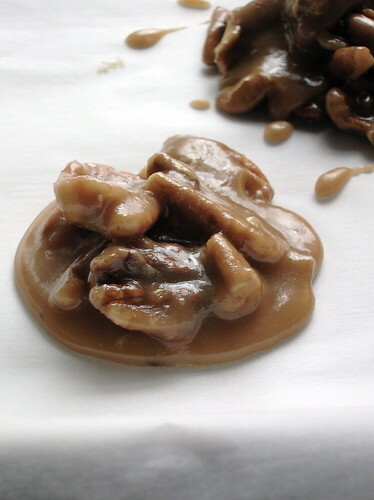 I've been looking for a good praline recipe to make for my husband for years. I can't wait to try it! Mercedes, your post is so beautiful! Your love story living away from your boyfriend reminded me of my own, fortunatelly we decided that an 8 hours car ride was too much and got together (the wedding was in 2002). My father is just like your mom, he loves to send letters, packages, newspaper articles, magazines and other things through the PO. It´s great to receive a package, isn´t it? I am addicted to your blog! I just bought a bunch of Pralines at the market this weekend to take back to Tennessee for an elderly friend. My parents live on Kiawah Island and we spend so much time there it is like I grew up in the low country! I plan on trying this recipe today. Thanks for the great post and recipe. Do you think these would work with soy milk for a vegan?